There are not a lot of electronic devices that are used in the sniping profession. Because of this, most of the development of products for sniping happens at a much slower pace than modern technology. But one of those electronic devices that we do use a lot is the Laser Range Finder (LRF), and the development of capabilities and features with the LRF have been happening at a much quicker pace than other areas of sniping. When the affordable compact LRF’s first came out, they were not very powerful and were lucky to be able to range a 700 yard non reflective target. They also had no features beyond just basic straight line ranging. The higher end models, primarily lead by Leica, were much more effective and could range to 1000 yards, but they were getting quiet expensive. Technological advances have now brought much more capability, though prices have stayed relatively high for the higher end LRFs. Bushnell has also done an admirable job keeping prices lower on their models, but reliable 1000 yard results on non relfective targets is hard to come by for the lower priced offerings. In fact, it has been hard to come by on the higher priced models as well. We consider reliable 1000 yard capability on non-reflective targets the minimum of what we want a LRF to be able to accomplish before we will recommend it. There have been a few, Leica and Zeiss being two of the nicer ones, and now we are checking to see if this new Sig Sauer Kilo 2000 will meet that standard as well. Sig Sauer decided a few years ago that it was going to branch out beyond making just their excellent handguns and limited rifle lineup and get into many other firearms and tactical related markets. Recently they introduced their Sig Optics sub brand and have released new models of rifles scopes, spotting scopes, red dot sights and other optics related products. 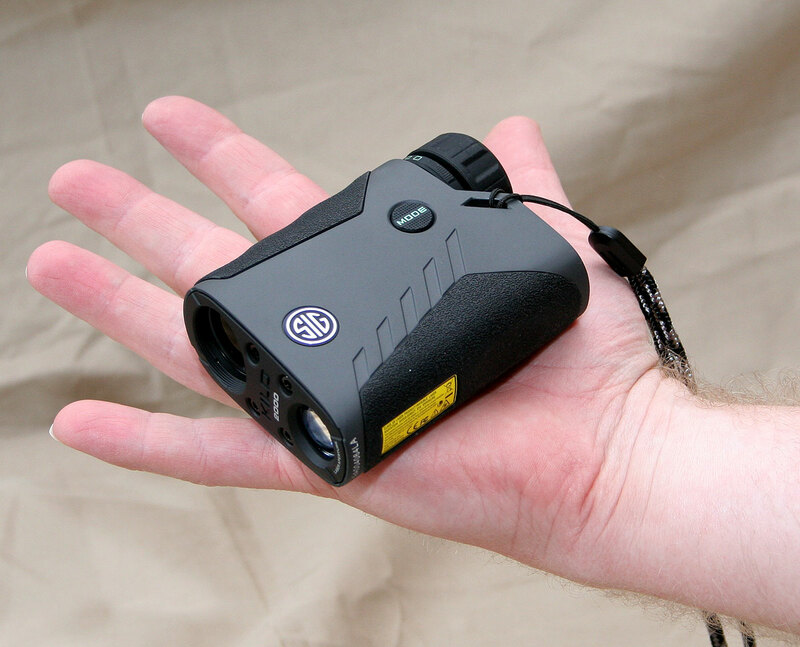 One of them is this Kilo 2000 laser range finder. Sig is known for high quality products and we have even reviewed their sniper rifle offering the SSG3000, which performed very well. We have a concern that this large onslaught of new products may compromise their reputation of quality, and in our quest to find duty capable LRFs that wont break the bank, we figured we would bring in one of the Kilo 2000s for review. 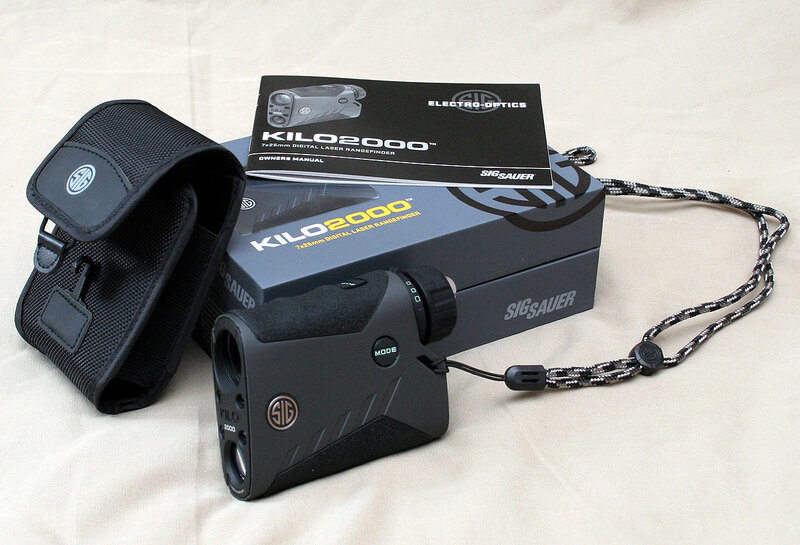 The Kilo comes with the normal assortment of accessories that you would expect to find with a Laser Range Finder. This includes a very nice box, a Cordoba protective carrying case, a lanyard, battery, and a good quality instruction manual that has some good information in it. The packaging and presentation is of good quality and gives the appearance that Sig is doing their best to maintain their high quality standards. We have checked out numerous lower priced LRFs that have had pretty good lasers that could almost meet our 1000 yard requirement, but a continuous problem we run into is a less than durable plastic body on the LRF itself. On the Kilo 2000, this is not a problem. The body housing is made of magnesium, keeping it lightweight but yet offering a much more durable unit. There is also a good quality soft rubber attached to the top and bottom to provide a good gripping surface for use in all types of inclement weather. The magnesium metal has a bead blasted non-reflective matte finish to it and the rubber is matte black as well, providing a good tactical appearance to the unit. Though there are some nicely made SIG logo medallions on either side of the main housing that have a little bit of shine to them and for field use we would probably mark over them with a sharpie, or maybe even try and pop them off. At the rear of the main body, and below the eyepiece, is the battery housing. The cap to the battery compartment is a nicely designed and built unit that has a flip up flap that is then used to loosen and tighten the cap. No more straining and struggling to get a good enough grip with your fingers on a cap, this is a smart and well executed design. It is these types of details that give us comfort that someone actually thought the design through and that Sig didn’t just repackage some other LRF from a OEM manufacturer. The eyepiece operates a little different than normal, or perhaps just a little different than we expected. The Kilo has an okay amount of eye relief, about .6″, or 15mm. This is just barely enough to allow a full sight picture while wearing glasses. The rear of the eye piece has a cup that rotates a quarter turn, but all that cup does is extend out and move back away from the eyepiece. According to the manual, it is used to adjust eye relief. But it actually doesn’t move any of the glass so it is not adjusting the actual eye relief, but rather it is just pushing the users eye back away from the eyepiece itself, forcing eye relief. In that quarter turn it adjusts out 6mm. Perhaps the intention is to try and keep the eye from making contact with the eyepiece glass but still allowing it to rest against the eyebrow or glasses to help stabilize the unit when ranging long distance targets. When wearing glasses of any sort, the eye cup needs to be rotated all the way clockwise putting it as close to the eyepiece as possible and allowing the users glasses to get closer to the eye piece to get the full sight picture. When not wearing glasses, it doesn’t matter where it is set as a full sight picture will be achieved. We have a feeling that the eye cup will likely be screwed all the way in most of the time. Just in front of rotating eye relief cup is the actual dioptre, or focus, adjustment on the LRF. There is a rubber ring that has a little v-notch indicator on top that helps the operator grab it to adjust the focus. The adjustment is fairly stiff and we found it easier to adjust when the eye relief cup is twisted all the way back. There are filled box markings to the right and unfilled box markings to the left to give a reference point, but in reality, the operator will just focus until the picture is sharp. The Kilo is one of the very few dedicated LRFs on the market that has an adjustable focus. Most other LRFs are not intended to be high quality optical glass and therefore to not have a focus adjustment. Of course the combination binoculars and LRFs that are on the market do have this feature, but they are a whole different type of device. This focus capability was yet another indicator of a higher quality than average product. 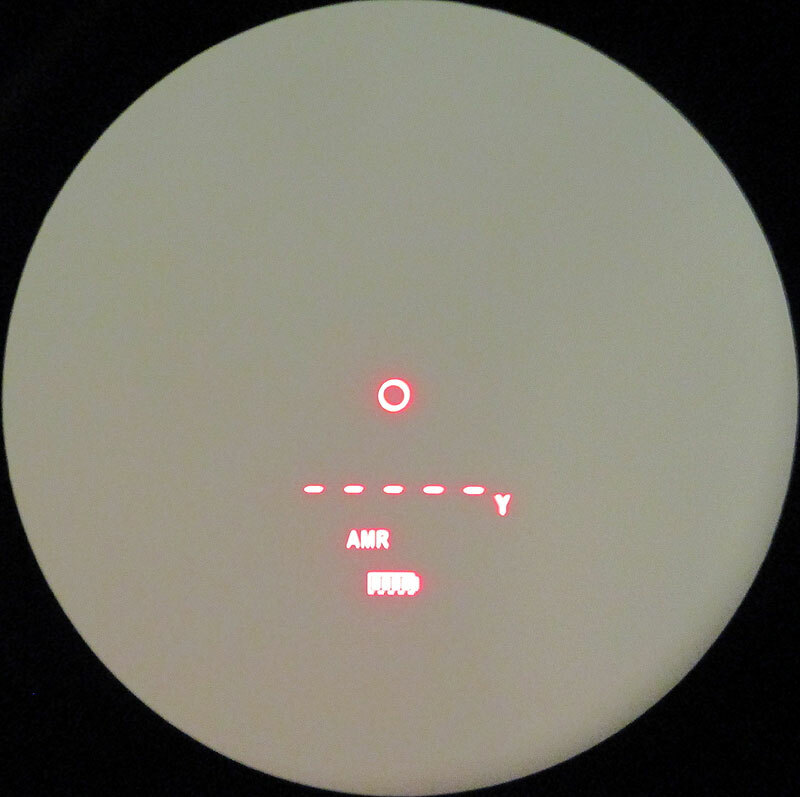 The reticle of the Kilo is a red illuminated reticle that is easy to read in all lighting conditions. There is a circle at the center of the viewing area that is the aiming point for the LRF. Below the circle is the range readout that can be displayed in meters or yards, indicated with a ‘m’ or ‘y’. The readout is actually displayed to the nearest .1 yard, which again is a bit more than the standard whole yard display on typical LRFs. Sig indicates that the Kilo is accurate to within .1 yard at distances under 100 yards. The accuracy diminishes as the range extends, which is normal. Beneath the range reading is the AMR symbol or Angle Modified Range. This is the actual horizontal range as adjusted for the angle to the target. This feature can be turned off if desired, but is a tremendous help with slope dope shooting and has become common on most long range LRFs on the market. The reticle has a unique auto dimming feature that we like. There is a sensor on the Kilo that detects how much ambient brightness there is and it will dim or brighten the reticle to one of 20 different brightness settings automatically. We tested it by using it indoors and turning a light on and off and it would take only about half a second and change the brightness level. It was quick and worked very well and the reticle was nicely lit and visible through all our testing in all light conditions. The operator can also turn off the auto brightness setting and select one of the brightness settings manually as well. The size of the Kilo is actually pretty small, but with the magnesium housing it has a good heft to it that gives it a feeling of quality and durability. It weights right at half a pound which is easily feasible for field use and its small enough to drop in a cargo pocket for easy access. Of course, it is electronic, so some care needs to be taken to keep it functioning when you need it. 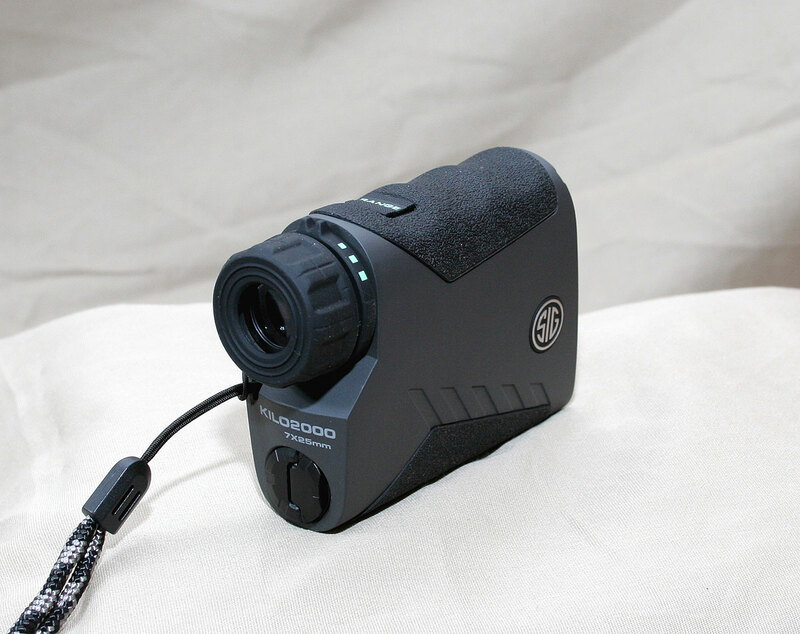 It is also waterproof and fogproof and comes with a lifetime warranty on the optics and mechanics, and five year warranty on the electronics. All of the settings are selected by using the “Mode” button on the left hand side of the housing and then using the “Range” button on top to make the selections when cycling through the different options using the mode button. You have to hold the mode button down for several seconds before it goes into the configuration mode, this will help prevent any inadvertent setting changes. All of these features and details are nice, but the real question is, how does it perform? Will it meet our 1000+ yard reliable ranging requirement on non reflective targets? We are very pleased to report that it does! Sig likes to boast about its advanced electronics and how it allows the fastest return of ranges because it does all this fancy stuff that we really don’t understand. What we do understand is that it works. The distances are reported extremely fast, and if you don’t see a range in under a second, then it couldn’t get a range. On typical LRFs, for field use, you can halve the claimed effective range of the LRF and use that number for your true capability in the field. So if a LRF says it is good to 1600 yards, you can count on 800 on non reflective targets in the field. Sig actually breaks it down for you with the Kilo. Reflective targets : 3400 yards, Trees: 1500 yards, Deer (Non reflective): 1200 yards. This is a good way to do it and based off our testing, they are not only accurate, but perhaps even a bit conservative as we were able to get ranges on trees and hillsides beyond 1500 yards. We are impressed. The Kilo can be operated by just pressing the range button once and getting a reading back, but there is an additional feature called HyperScan mode that has some distinct advantages. HyperScan mode is activated by holding down the range button instead of just pressing it once. As long as you keep the range button held down the Kilo will continuously updated the range 4 times a second as you are scanning the target area. When you release the range button, it continues to display the last received range in the view finder. Its a very effective way to range those difficult targets that are far out there near the limits of the Kilo’s capabilities. There are times also that you can get an accurate range by holding down the range button and hit all of the objects around the target if the target is small and difficult to get a specific range on. This is perhaps one of the most impressive features of the Kilo and is the key to getting good ranges at far away targets. A warning though for those operating in a tactical environment with the potential of night vision devices being used by the enemy. Remember that the laser that is used by LRFs are visible in many infrared night vision devices, and if you are holding down the range button, you are sending out a lot of laser shots that can give away your position. Though it is not often you would use a LRF during night. The optics are not considered binocular grade, but they are much better than the traditional lower priced LRF and are good enough to be used for quick minocular scans, even without using the ranging capabilities. Then if you discover a target, a quick range read is right at hand. The optics are perhaps not as good as the Zeiss LRF, but certainly better than a vast majority of LRFs. Overall, yes, we like this LRF and it goes up toward the top of our recommended LRFs. There is not a lot that we can find fault with and it has the capabilities we desire. Eventually technology will continue to progress and more capability will be available, hopefully Sig will continue development of the Kilo and stay at the top of the available LRFs on the market. The price is higher than some of the lower quality units out there, but not as high as the top end, which makes it a pretty good deal as well. This sounds like a good device without costing the earth. Good to see Sig branching out. thank you so much for the review. based on it i just purchased the sig. i love it. it is small and light that i can carry it everywhere. this will greatly assist my long range shooting. Our pleasure, glad we were able to help! Great review, wish you had done this review 2 years ago… now i want to upgrade again. Just got one of these and when I tested it out, I was getting good ranges on trees at over 2200yds! Definitely agree with Mel: about the only thing this LRF lacks to be perfect is the 1/4″ attachment for a tripod. Here’s the fix for that… i found a $15 “large cellphone holder” bracket for mounting a phone to a tripod for taking pics. It stretches out and holds the phone (or sig kilo) with spring tension. It even folds flat so it fits in the kilo’s case. These are nice but if you want something that the military uses, look at Newcon Optik. They have a full range including some very expensive models that range out to 20 kilometers. Yes, they are nice units and we have used them and have one up for review later this year. But price wise, they are in a different league. Who makes the best range finder? The big thing is your budget. There are some EXCELLENT high power LRFs out there in the $2000-$3000 range, and those would be considered the best. I’m looking at buying the Sig Kilo or Leica 1600-B. How do they compare to one another? If you could choose just one. Which one would you go with? Wow, good question. They are both excellent LRFs. The Leica is going to be more money, but I think the laser might be a bit more powerful than the SIG, but the SIG has some nice features like the continuous scan that will help overcome the lower powered laser compared to the Leica. I lean a bit more toward the SIG, but the Leica is solid and has been around longer. Excellent review. Sure did a very thorough job! Hats off to you. I also was considering the Leica or the Kilo and leaning toward the Kilo. Do you know where they are manufactured? There is a certain country I do my absolute best not to buy from them. Thanks in advance. Great question. We have looked everywhere on the unit itself and cannot find an origin label. So we are not sure… perhaps someone else knows? The box mine came in says “designed by Sig Sauer in Oregon, assembled in China – ART 7400192-R02”. By the way bought mine at end of October used once in Oregon during Elk hunt now it will not display any data with any combination of buttons pushed or time sequence. Calling Sig this week. Thank you for the information! Keep us posted on SIGs response. Ours has help up well so far. How does the Sig Kilo handle a bit of nearby brush or grass between you and a distant target (coyote, deer, elk) say beyond 200 yards?? Excellent question and one that has a good answer! It actually does quiet well. The laser dispersion is fairly tight, even though the darn reticle is a round circle. We are able to laze between brush reliably and through tight loopholes. But you cannot expect miracles either, so while it is good, it still has its limitations. Can this LRF also be used by the crossbow hunter? What is the minimum accurate distance that it will read? Thanks for the review! How does the SIG perform in weather? I have a Leica 1200CRF and it does great EXCEPT for snow/rain/fog, where it tries to return the distance for the first raindrop or snowflake it hits, which is usually just a few feet away; very unfortunate limitation. Several years ago I tried a Leupold that had some issues but did have a GREAT feature called “Last Target Mode”, where it returned distance from the last target that the laser bounced off of (e.g. a deer @ 400 yards) and ignored the reflections from the raindrops it hit along the way. Sometimes you want your rangefinder to measure the first target & sometimes you want it the last, e.g. when aiming at a leafless tree, one time you might want to measure the distance to the tree & other times you might want to measure the distance to the hillside that you can see through the branches. Thanks! That is an excellent question and we have not yet used the one we have here in snowing or raining conditions. Weather forecast is for some freezing fog later this week, we’ll try it then to see what we get. Great, I look forward to your results!! I have Sig Kilo 650 and it does have “best” or “last” target so it will pick the last object the laser hits, the Kilo 2000 has that too. I have tested my model (way cheaper than the 2000) on distances up to 800 yrds with some difficulties, no problem up to 600 yrds. It works exactly as the specs. It also works well in dim light or bright moonlight, but my display is hard to read, the 2000 model should be better. The “scan” mode is great in case you not certain which object it picked up since it gives you constant measurements to nearby objects and you can decide if its right or wrong easily. If i use green light at night, whatever object i can put the light on, the Kilo will pick it up and measure the distance to it, even in pitch black. Keep in mind i have the 650 model . To work this out with the 2000 model you need expensive green light torch for long distances. Mine is rated at 300 yrds, works well at twice that. The Leica has a very narrow beam/laser which may be its only advantage, and also measures temperature and pressure. By law the country of origin has to appear somewhere on the packaging, usually in microtext down in one corner on the back, especially if not made in US. Not sure, but I think SIG optics are US made. We’ll check on the unit again, but we looked hard last time. We do not have the original packaging any longer and we wonder if that is where the country of origin was listed. Great review! But still left wondering?! So it’s the holiday season and my brother has asked for a great stalking rangefinder. We are set for a couple hunts next year, including one to Alaska! After the gear and trips are all said and done, I don’t think a Vectronix or Newcon is within reason… I don’t want it to be another direct comparison question however maybe you have actually fielded all 3 inquiries? I’ve read the kilo has a large aim point circle and isn’t as precise as it should be? So, Out of the Sig Kilo or Leica 2000-B what would you take? And at this point, would you step into the Gunwerks G7? They are like $400 off right now. Any further insight on actual use of these 3 would be greatly appreciated! Well, honestly, if you had the money, the Leica and Gunwerks are better option, but the Kilo is a solid choice if your budget is not as high, which is why we liked it. The larger reticle is not as accurate, but the constant laze function helps there and the dispersion still seemed to be good enough to not be an issue. 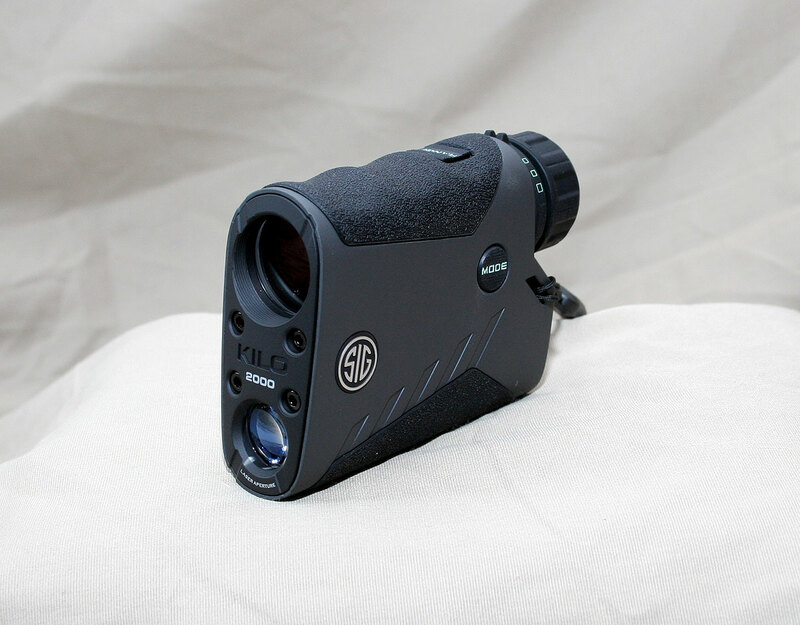 Anyone know when the sig sauer kilo 2200 range finder will launch on canadien market ? I just ordered a Kilo 2000 from DVOR for $330, brand new. I have been using a Nikon Monarch for the last several years with good results, but I think the electronics are getting “tired” (I am an electrical engineer). The biggest problem I have had with any LRF is ranging rodents out on the prairie, where the terrain can be rolling; therefore, deceiving. Lasing the desired target can be difficult (to pick out from “clutter”. I am excited about the Kilo 2000, and will keep the Nikon for back-up or for my buddies to use. I am an exclusive SIG handgun shooter as well, so the Kilo will be right at home with its distant cousins.